It is our Giantex resin 2-tier barrel water fountain which features its exquisite craftsmanshipand classic design. It is perfect for your yard, garden or patio and lookseye-catching and impressive. A well pump uses a self-contained waterrecirculation system to create a gentle trickling sound that make you feeltranquil and feel like staying at a quiet yard. It is an ideal choice for yourhome! 【Perfect Ornament】- It just needs to be plugged in and filled water. This barrel fountain serves as a beautiful garden or patio ornament or outdoor sculpture. It can perfectly make you enjoy visual and auditory beauty. 【Rustic Barrel Design】- This fountain is characterized with two resin barrels and a pump from which water can flow down into two-tier barrel. You can hear gentle running water sounds. 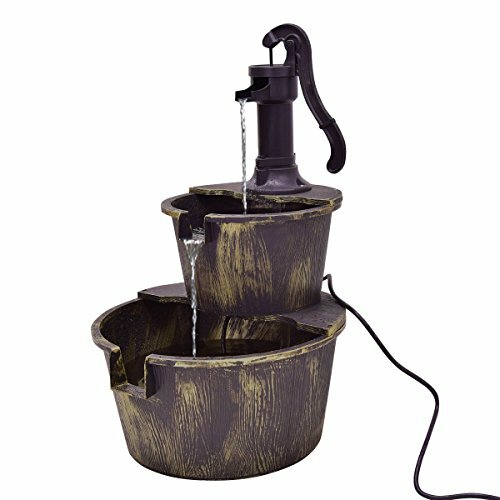 This decorative fountain will flourish your creates a charming and resin home ambience. 【High-quality Material】- The main material of this barrel fountain is PP which is durable and solid enough to serve longer time outside your home or in your yard and patio. 【Submersible Pump】- The pump creates a gentle trickling sound that will transport you from your backyard to the serene countryside and make you enjoy a comfortable beauty. 【Stable and Adjustable Water Flow】- There are two positions which are designed for adjusting flow of water. Four suckers are set for fixing and stabilizing. If you have any questions about this product by Giantex, contact us by completing and submitting the form below. If you are looking for a specif part number, please include it with your message. © 2019 - growwebsite.com. All Rights Reserved.